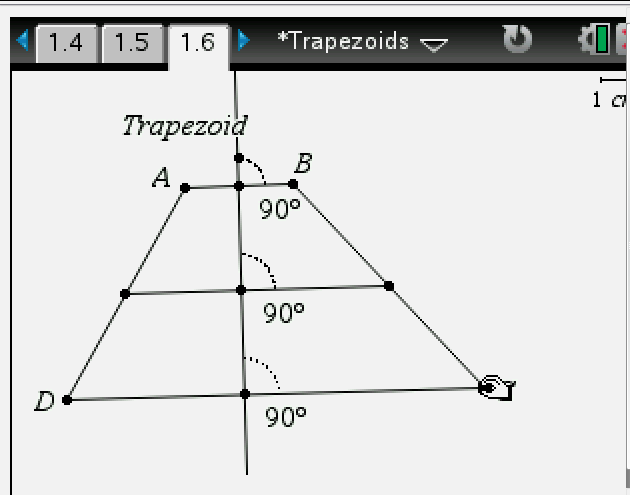 I’ve written about the diagonals of an isosceles trapezoid before. 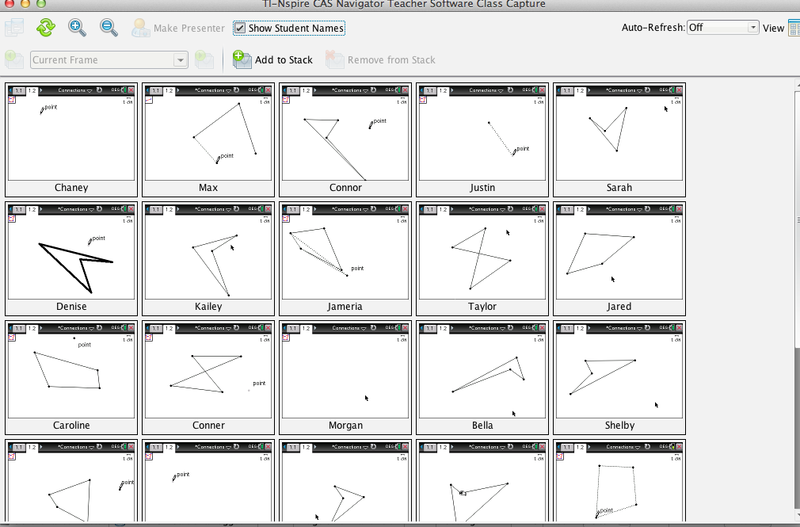 When we practice “I can look for and make use of structure”, we practice: “contemplate before you calculate”. We practice: “look before you leap”. We make mistakes; the first auxiliary line we draw isn’t always helpful. Or sometimes we see more than is helpful to see all at one time. Even with the same auxiliary lines, we don’t always see the same picture. While I am not exactly certain what “and conversely” modifies in this standard, I do want my students to think about not only the necessary conditions for naming a figure a parallelogram but also the sufficient conditions. 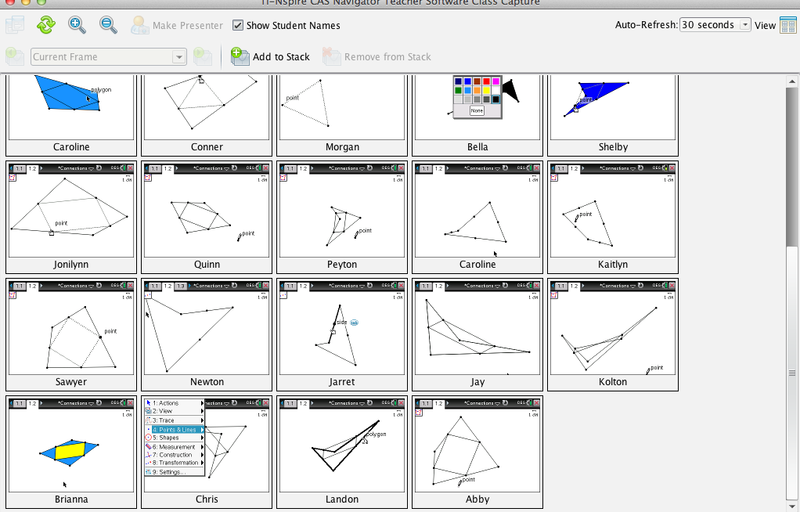 I can determine sufficient conditions for naming special quadrilaterals. 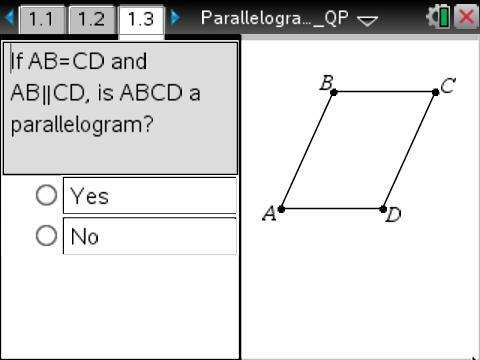 I’ve sent Quick Polls before asking students to determine whether the given information is sufficient for naming the figure a parallelogram. Luckily the teachers with whom I work have kindly let me know how pathetic the questions are, and so I no longer send them. 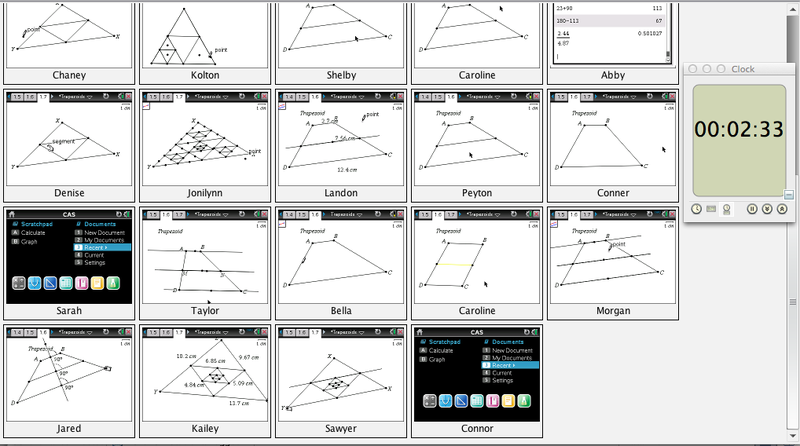 So how can we get students to determine the sufficient information for naming a figure a parallelogram without giving them the list from their textbook to use and memorize? 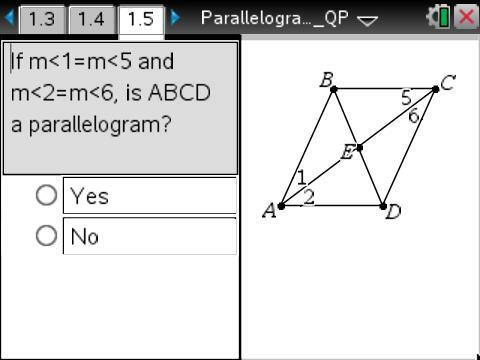 I started this lesson by showing three (pathetically drawn) figures with some given information and sending a poll for them to mark each figure that gives sufficient information for a parallelogram (more than one, if needed). Granted it’s only a bit better than the Yes/No Quick Polls, but it is better, and it did give students more opportunity to construct a viable argument and critique the reasoning of others than the one-at-a-time polls. 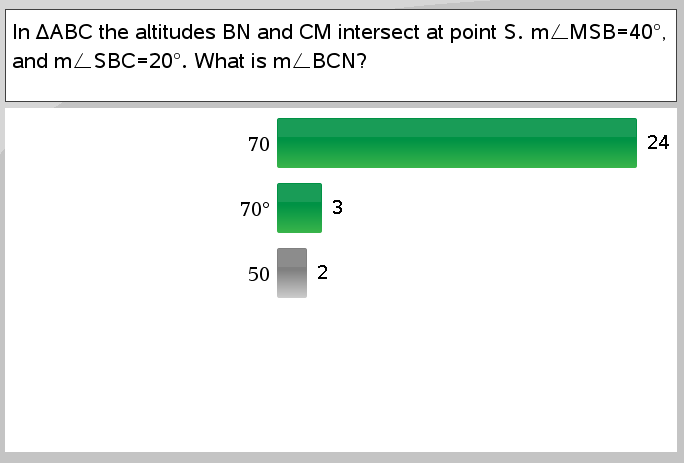 For an item like this, I especially like showing students the results without showing the correct answer, as that leaves room for even more conversation about math. 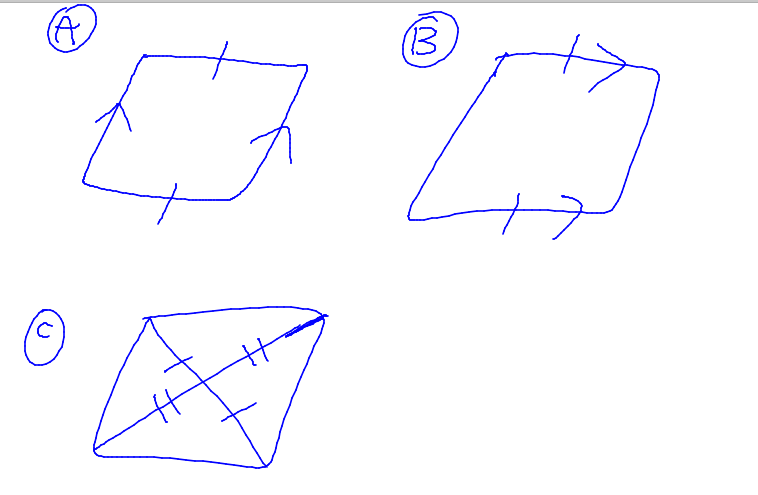 Next I asked them to construct a non-special quadrilateral and then its midpoint quadrilateral. 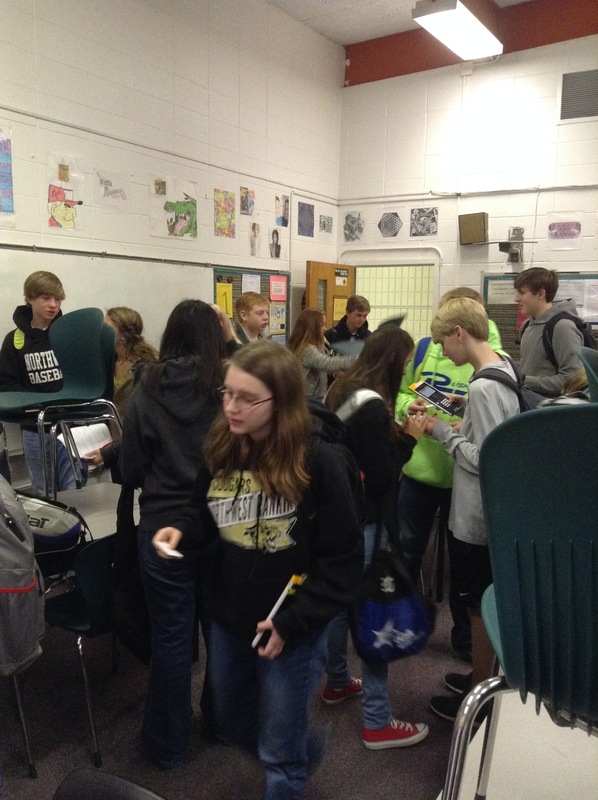 I blog to reflect on my practice in the classroom. And so what I know now is that I should have asked students to measure and/or construct auxiliary lines using a sufficient amount of information to show that their midpoint quadrilateral was a parallelogram. 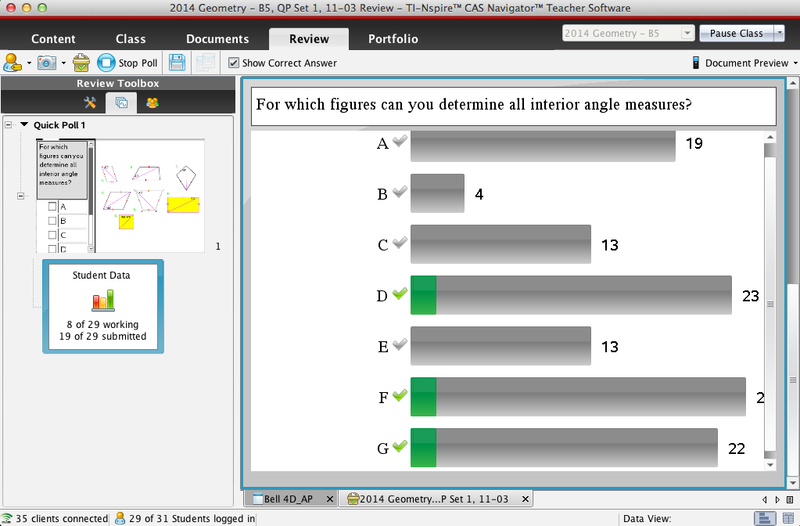 Everyone wouldn’t have measured the exact same parts, and I could have used Class Capture to select students to present their information to the class. But I didn’t think of that during the lesson. 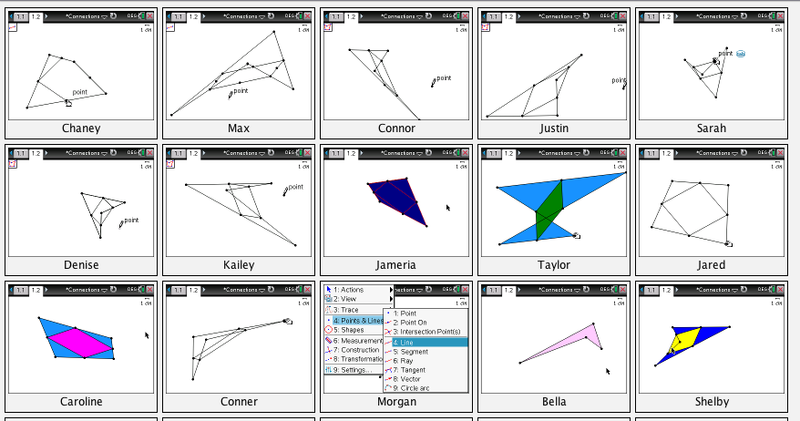 The students played with their construction, some recognizing that the midpoint quadrilateral is a parallelogram no matter how they arranged their original vertices. 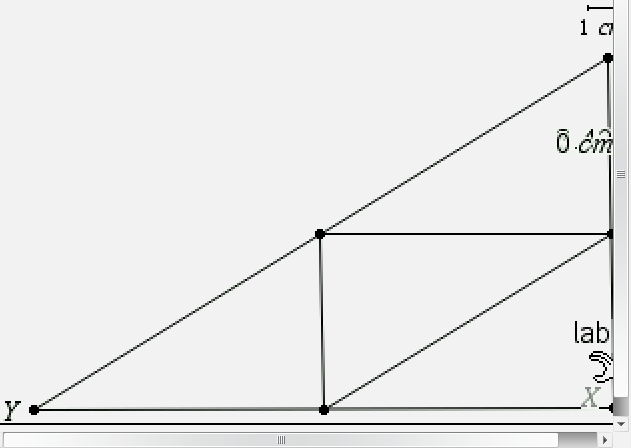 Others recognizing that every successive midpoint quadrilateral would also be a parallelogram. And none connecting what we had done at the beginning of the lesson with what we were doing now. And none proving why the figure had to be a parallelogram. I feel like the proof of why should come after we study dilations. 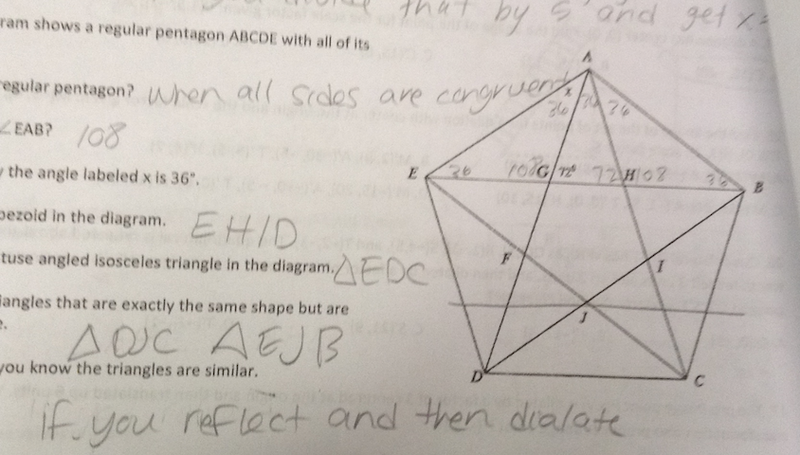 But I like students figuring out that the figure is a parallelogram during our unit on polygons. So maybe, eventually, we will move dilations earlier in the course. 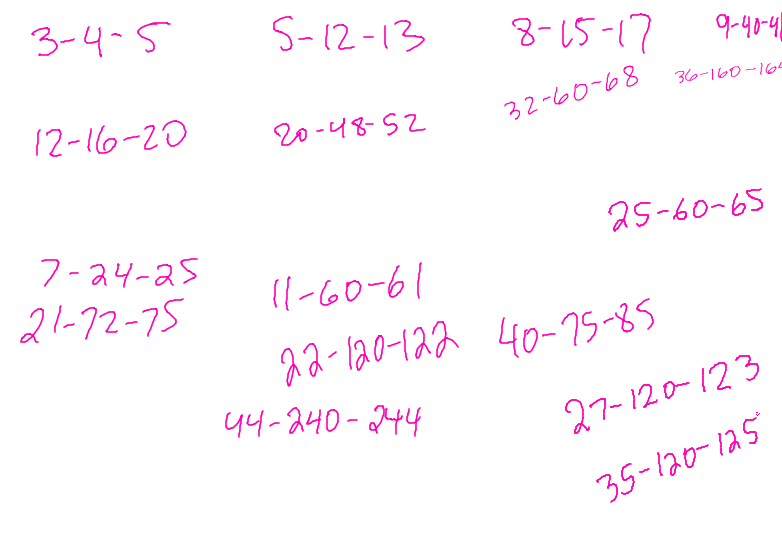 Or maybe we can revisit the why-they-are-parallelograms after or during the dilations unit. Or maybe we can revisit the why after or during the dilations unit. What do you do when the standard for the day gives away what you want students do explore and figure out on their own? I’ve made a deal with my administrator to post the process standard for the day (Math Practice) instead of the content standard. 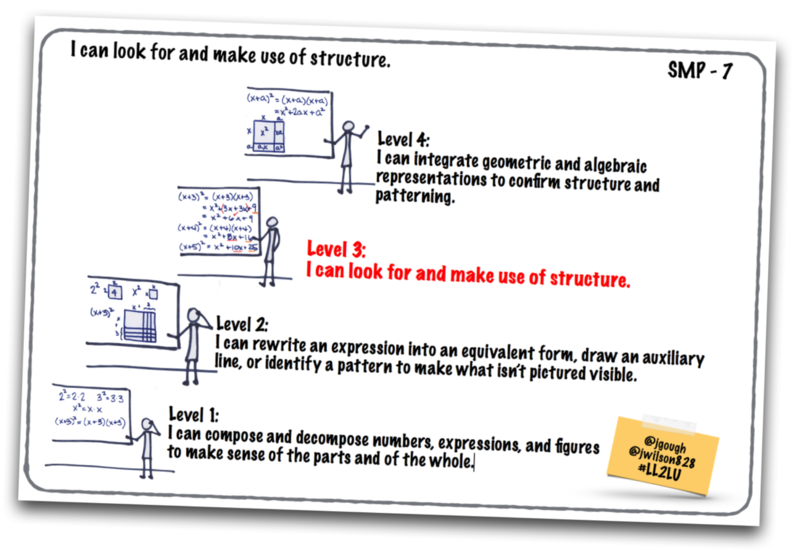 In many of our geometry classes, our learning goals include look for and make use of structure and look for and express regularity in repeated reasoning. A midsegment of a triangle is a segment whose endpoints are the midpoints of two sides of the triangle. 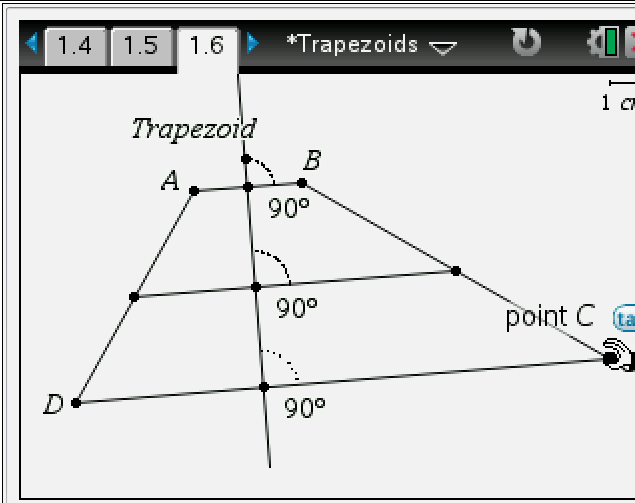 The midsegment of a trapezoid is a segment whose endpoints are the midpoints of the non-parallel sides. Then we constructed the midsegment of a trapezoid. Students observed the trapezoid as I changed the trapezoid. 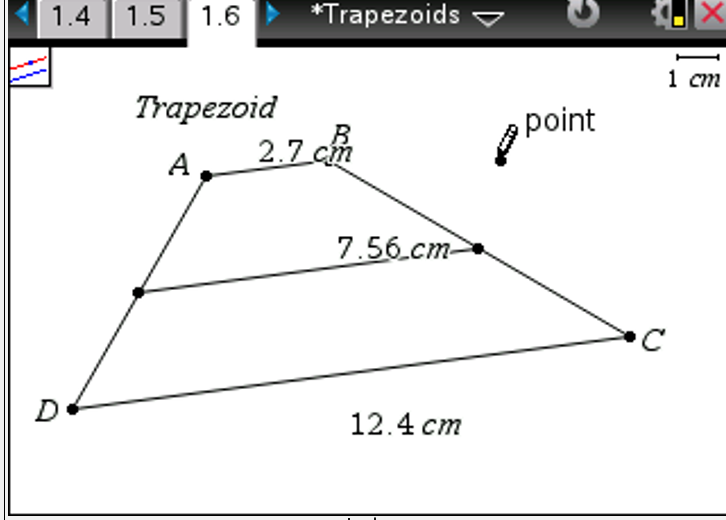 I sent a Quick Poll: What do you think is true about a midsegment of the trapezoid? 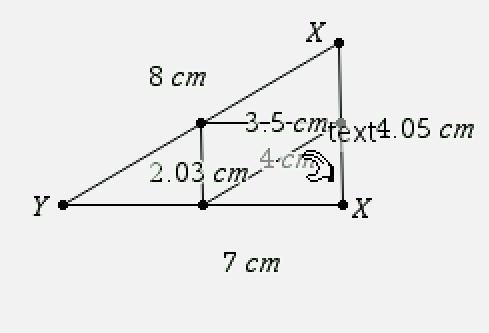 Triangle XMN is similar to triangle XYZ. In order to change things up a bit, I quickly printed the students conjectures, cut them up, and distributed a few to each team. Now you decide whether the conjectures you’ve been given are true. And if so, why? 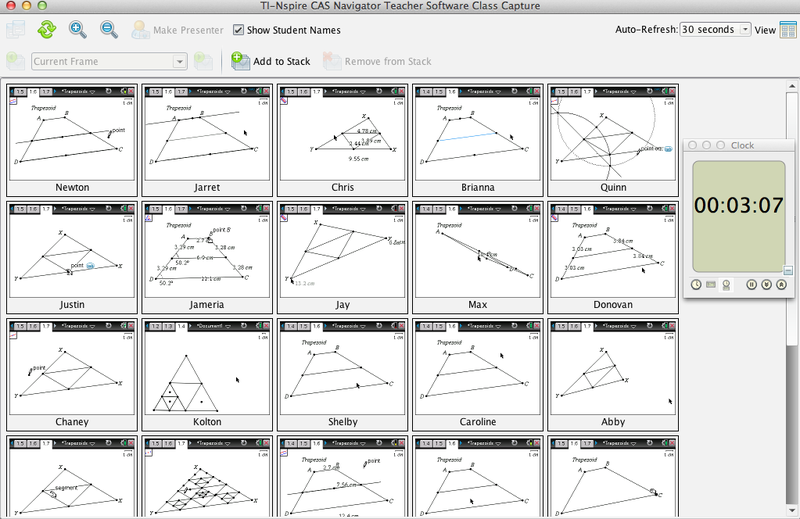 I used Class Capture to monitor while the students talked and worked (and played/explored beyond the given conjectures). 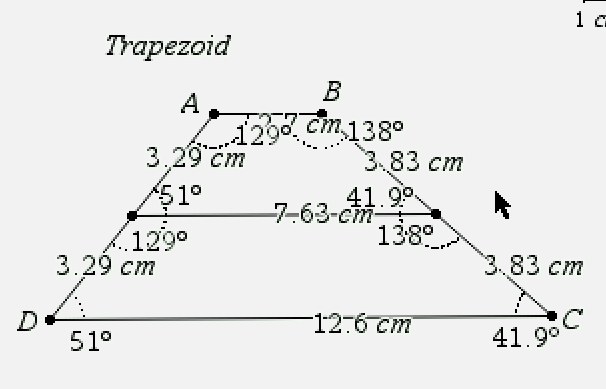 Trapezoid ABCD is similar to ABNM. And then we talked about how they knew these statements were true. Jameria had a lot of measurements on her trapezoid. I made her the Live Presenter. What conjectures can we consider using this information? I made Jared the Live Presenter. What does Jared’s auxiliary line buy us mathematically? I made Landon the Live Presenter. What conjectures can we consider using this information? 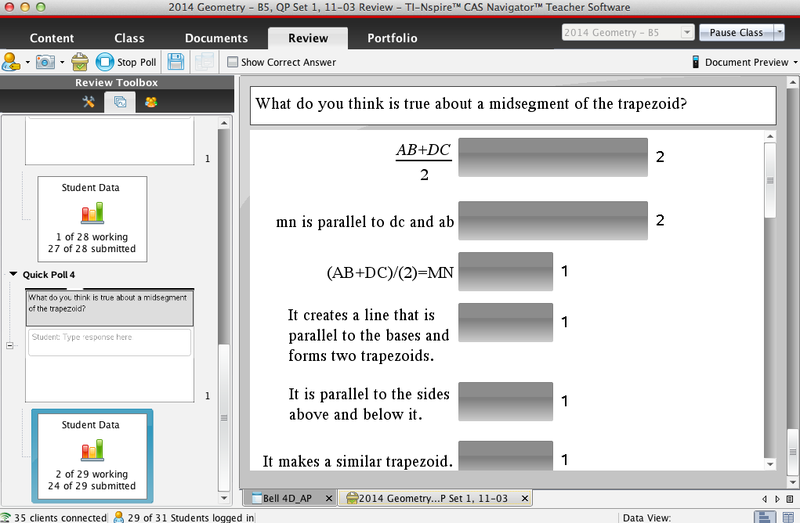 I sent a Quick Poll to formatively assess whether students could use the conjecture we made about the length of the midsegment compared to the length of the bases of the trapezoid. 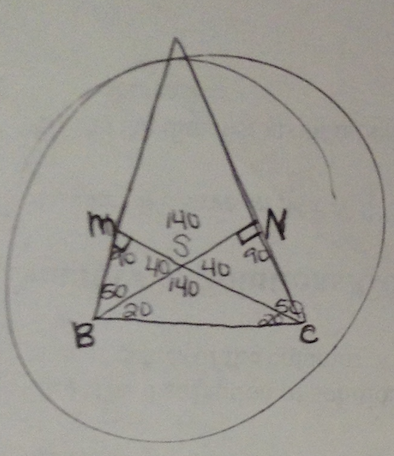 What about the midsegments of a triangle? We had not yet started our unit on dilations, and so there was more to the why in a later lesson. 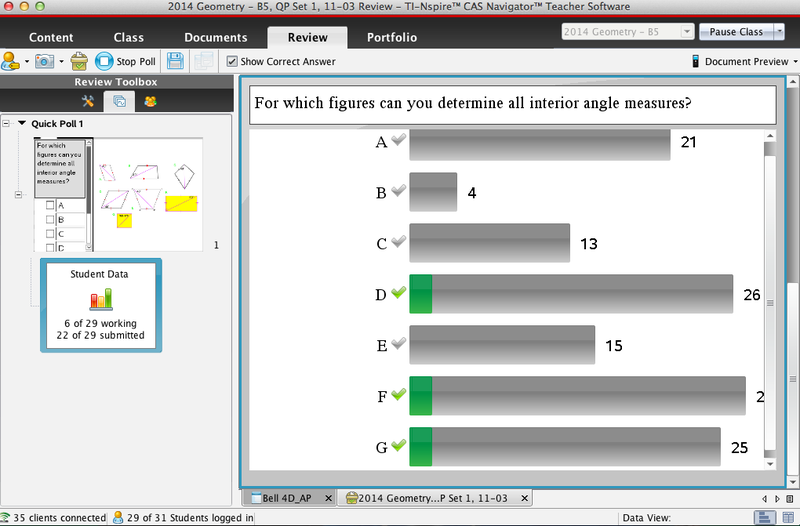 And so the journey continues, even making deals with my administrators as needed, to create a classroom where students get to make and test and prove their own conjectures instead of being given theorems from our textbook to prove. We found several good tasks to use throughout our unit on polygons. I had heard of the NRICH site before but had not used it. 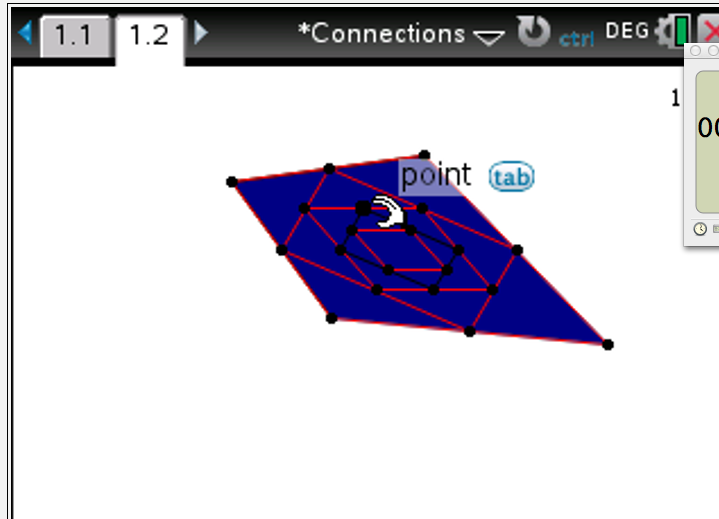 A search on NRICH for polygon angles turned up some out-of-the-ordinary tasks. A quadrilateral can have four right angles. What is the largest number of right angles an octagon can have? 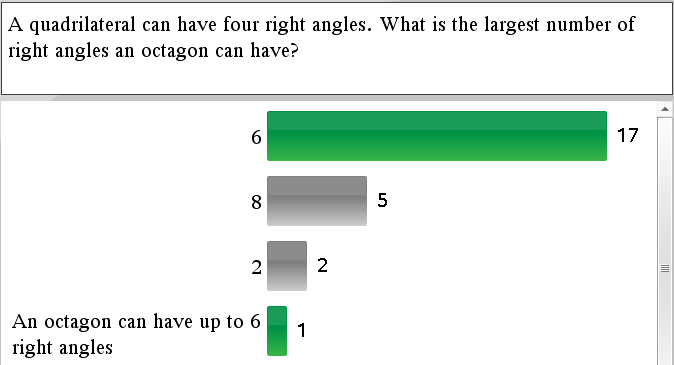 I was surprised at how quickly my students thought to draw a concave polygon to explore this problem. 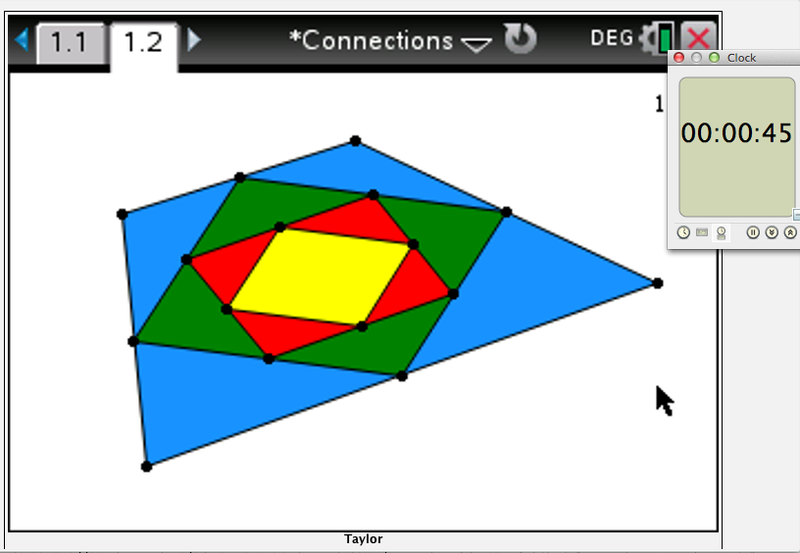 I went straight to a convex polygon first when I thought about it. I think this has to do with look for and make use of structure. We’ve asked “what do you see that’s not pictured?” We’ve learned geometry by drawing auxiliary lines. 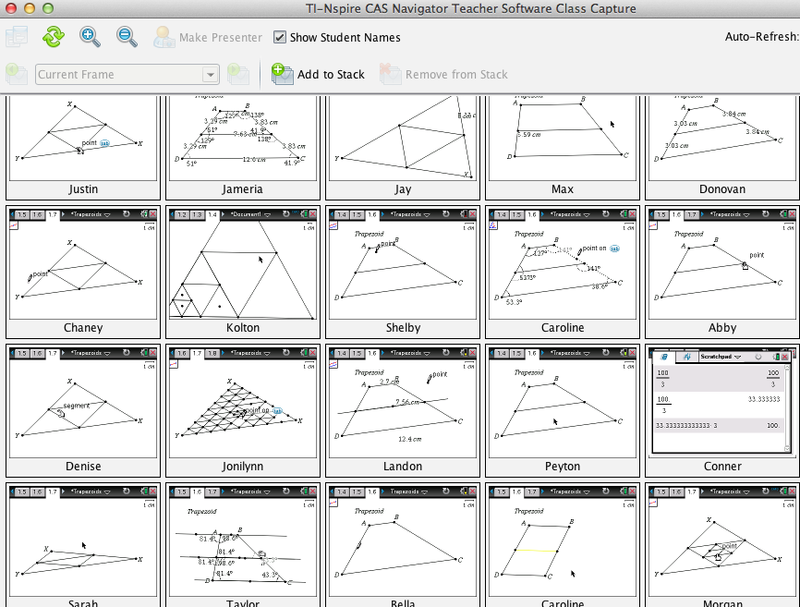 I’m convinced that my students think differently than I do because of how they’ve learned geometry. I can’t remember where I got the next problem. But I like that it asks for both a calculation and a proof of why the triangle must be isosceles. When I saw the student results (27 out of 30 correct), I had to think quickly about whether it was worth the time to go through the proof. I decided that it was. My students had been asking for more practice with proofs, and so I figured this was an opportunity to let them compare their work with the rest of the class. A student led us through her reasoning. 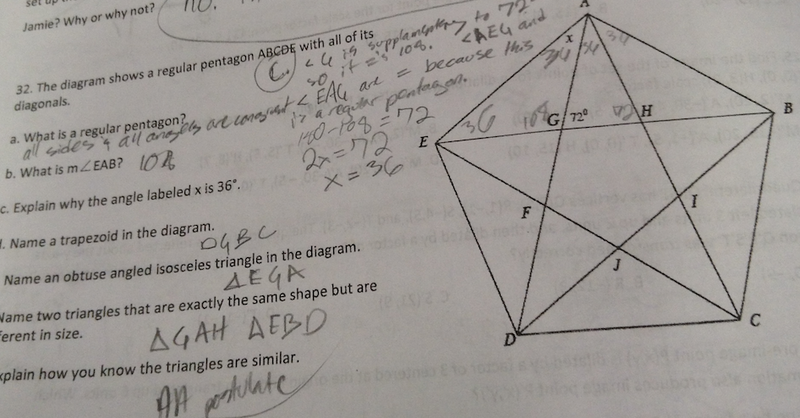 I can’t remember where I got the regular pentagon task, either, and my attempts at googling have failed. I have two favorite responses. 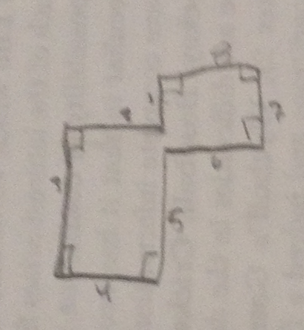 For the trapezoid requested in part (d), a few students listed a parallelogram. 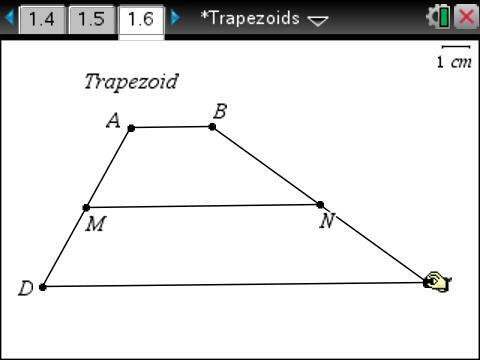 I love that my students have embraced our inclusive definition of trapezoids, and I love that they feel confident enough in their understanding to include a parallelogram as the answer to a question about a trapezoid. 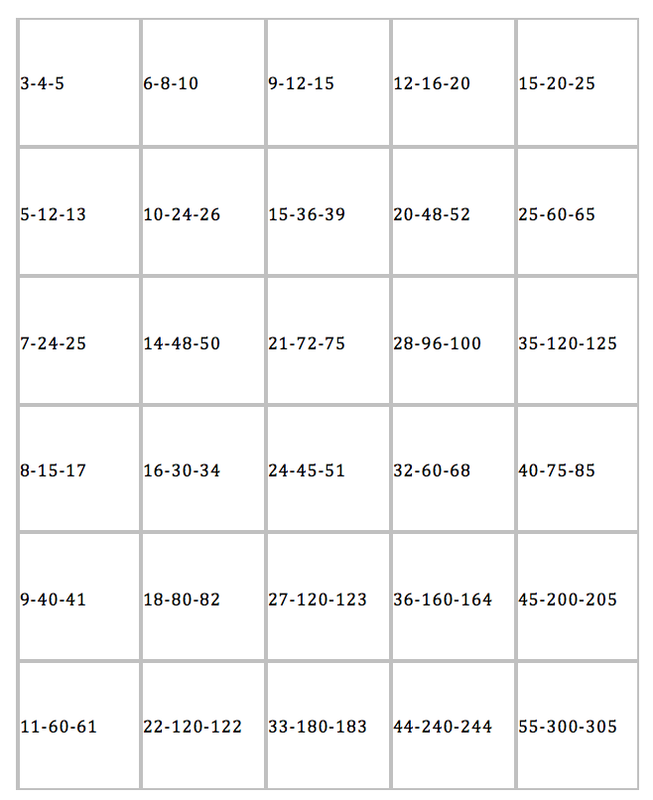 We have incorporated Shapedoku into this unit as well after reading Reinforcing Geometric Properties with Shapedoku Puzzles in the October 2013 Mathematics Teacher. 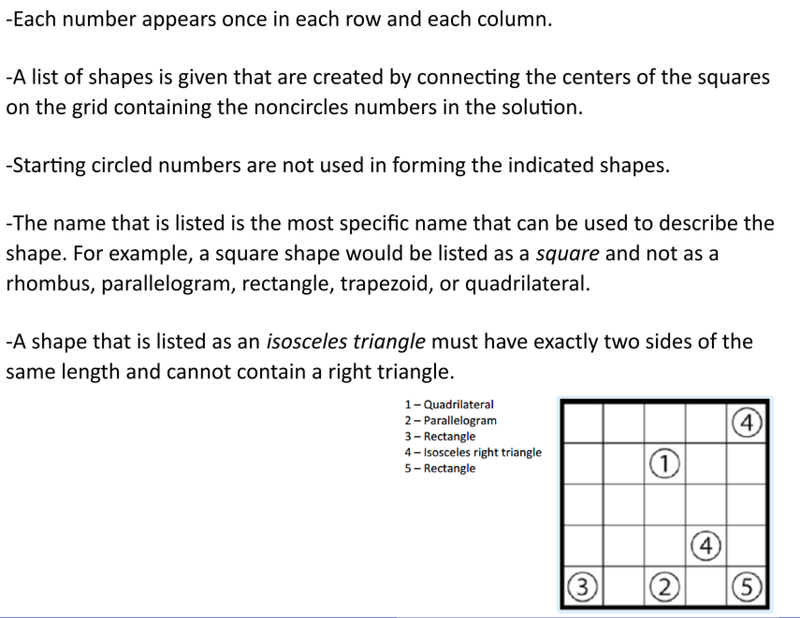 Finally, we tried something different for conversation about angles in quadrilaterals. 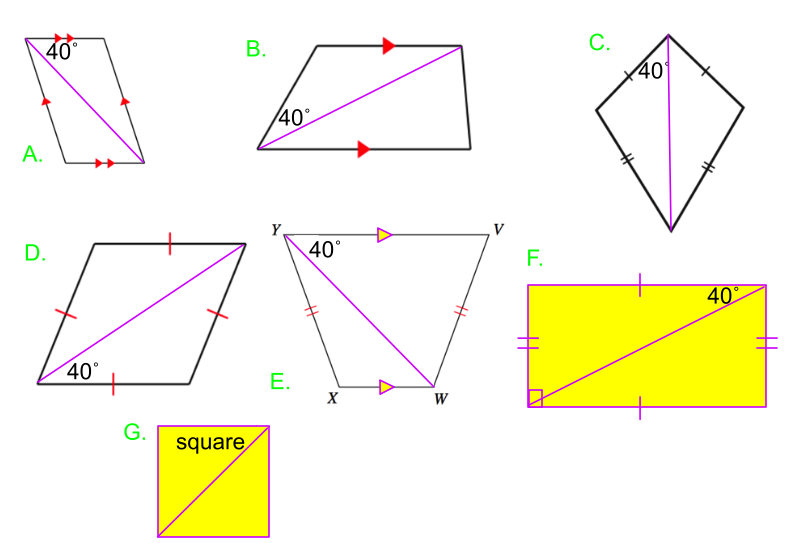 My students do need some practice with using the properties of quadrilaterals to calculate angles measures … but the regular types of problems can be so boring. So I gave the regular types of problems with a twist. 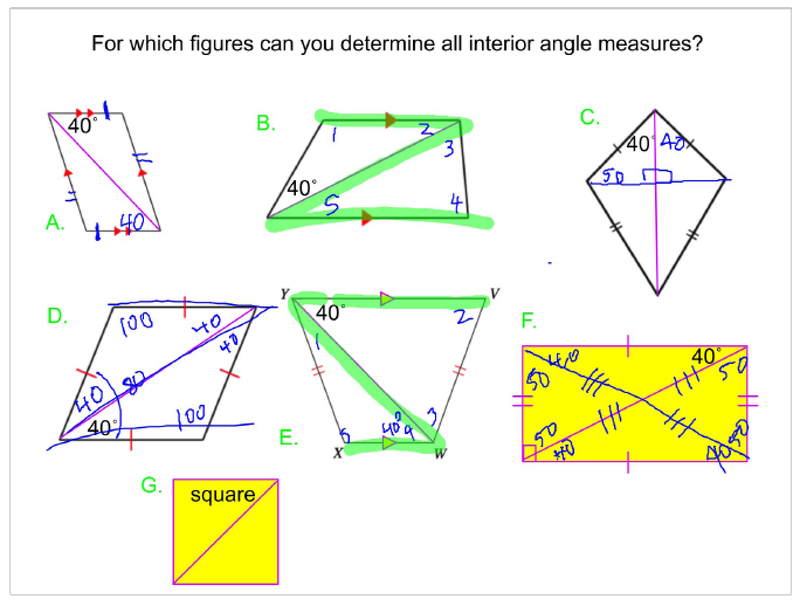 Given one angle measure, for which figures can you determine all remaining angle measures? 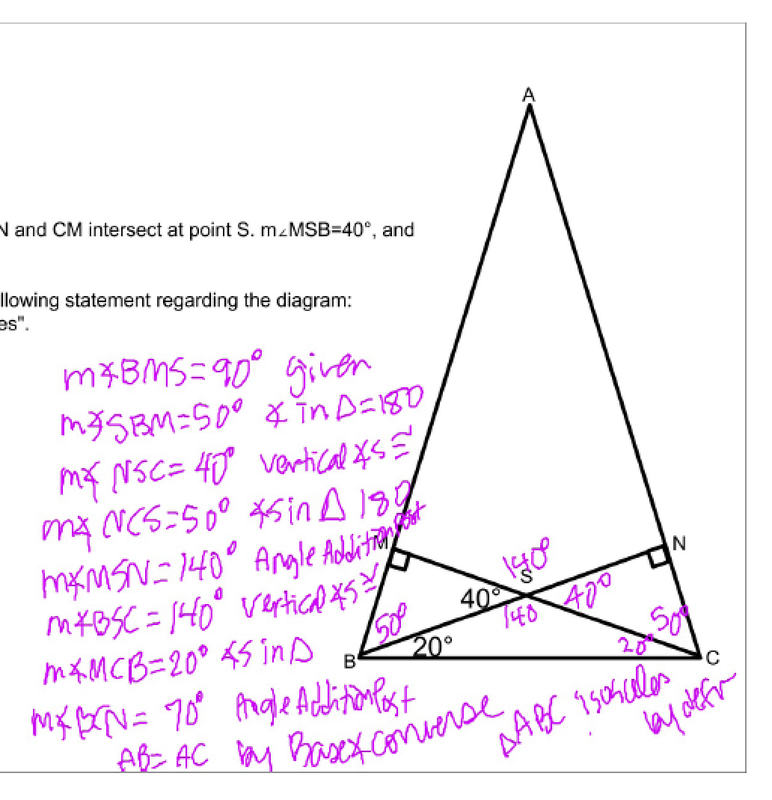 This gave students practice with properties and angle measures, and it provoked conversation that giving problems like this one at a time wouldn’t have. 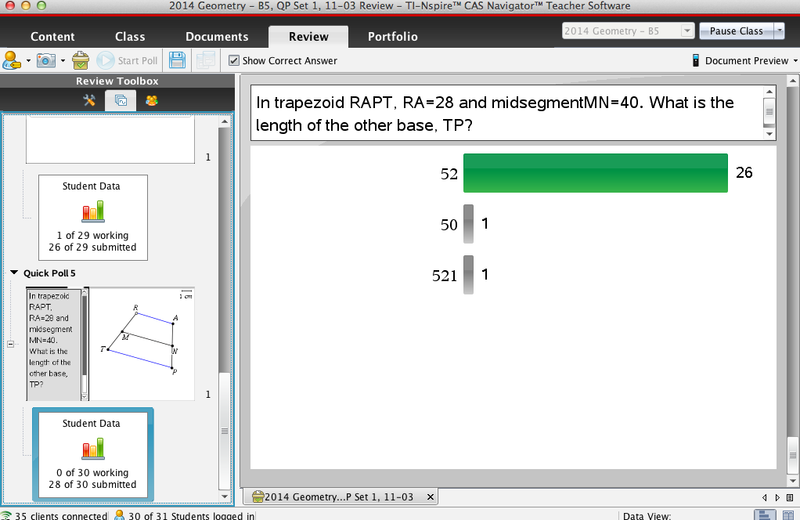 The next class, I used the same diagrams but gave part of one of the interior angles formed by a diagonal. 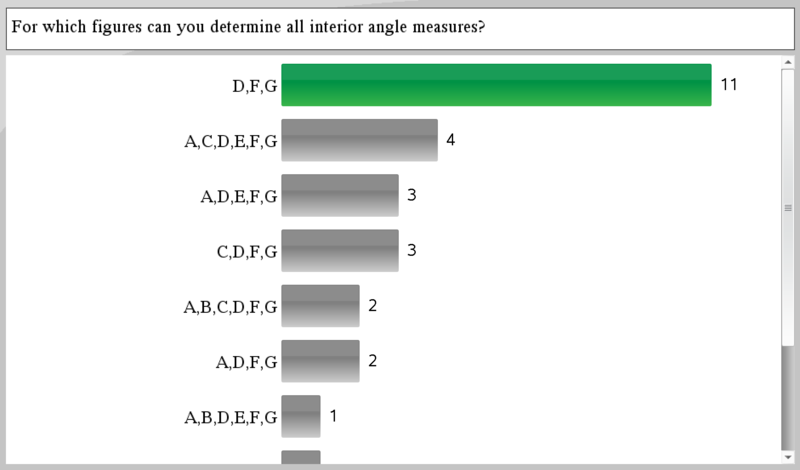 The question was the same: Given one angle measure, for which figures can you determine all remaining angle measures? 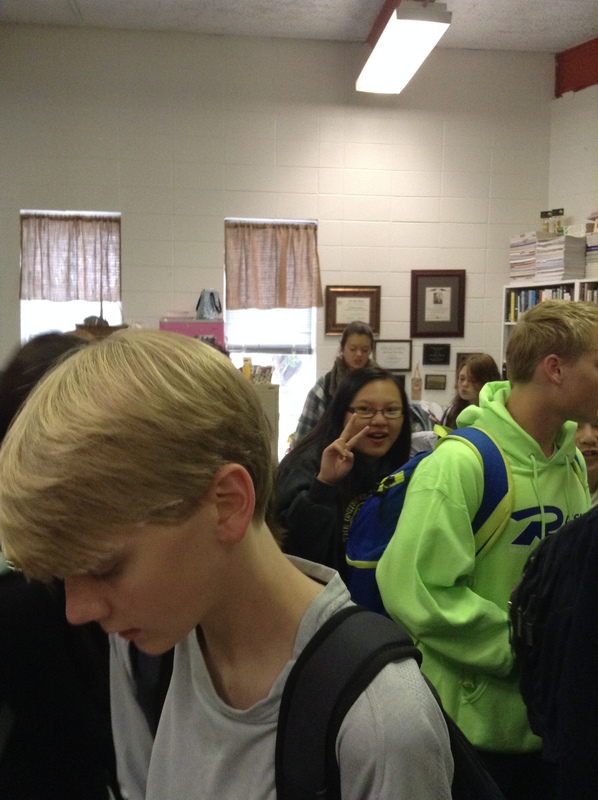 I watched as students worked. And eventually had them talk with each other. I can show student responses separated (as above) or grouped together (as below) to help decide which students to ask for explanations. Again, we had good conversation that wouldn’t have happened had I asked the problems one at a time. Incorporating new tasks each year keeps the class interesting for us as teachers as much as it does for our students. 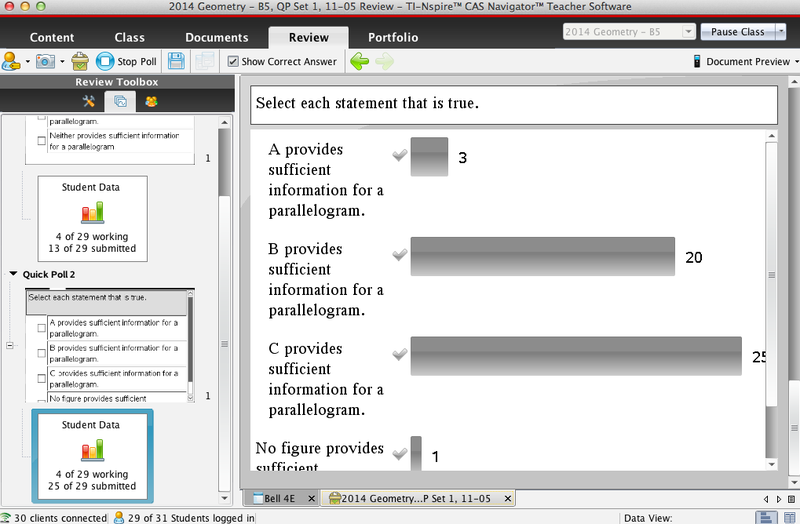 When is the last time you looked for a new task at NRICH or Illustrative Mathematics or the Mathematics Assessment Project? 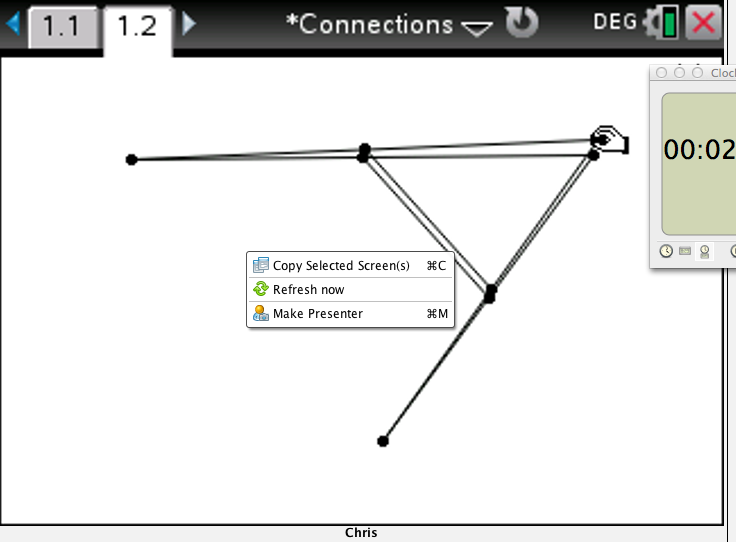 Or when is the last time you used a task you read about on someone’s blog or found through someone’s Tweet? And so the journey continues … with thanks to all of you for your suggestions along the way. We have had students change teams on the first day of each unit this year. Which is something, as I’ve always hesitated to change up teams that are working well together in the past. But since we are now on Unit 5, it’s the expectation. If the sum of two angles is 90°, then the angles are complements of each other. 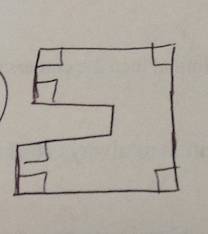 If two angles are complements of each other, then their sum is 90°. If the sum of two angles is not 90°, then the angles are not complements of each other. If two angles are not complements of each other, then their sum is not 90°. The sum of two angles is 90˚ if and only if the angles are complements of each other. Students learned during the first lesson about converse, inverse, etc., and each team had their own card set for discussion. For the Polygons unit, we used different non-special rectangles, trapezoids, parallelograms, kites, rhombi, and squares. 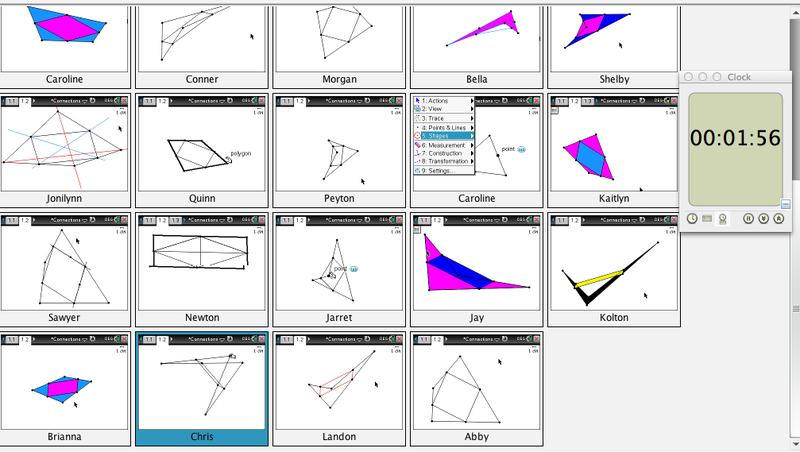 Which wasn’t totally easy, as students were unfamiliar with kites and don’t always distinguish rhombi from squares. 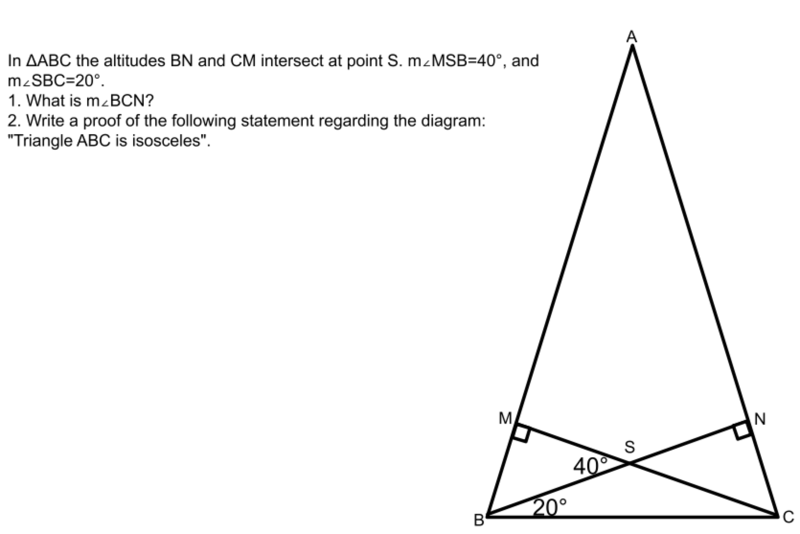 Is it a right triangle? 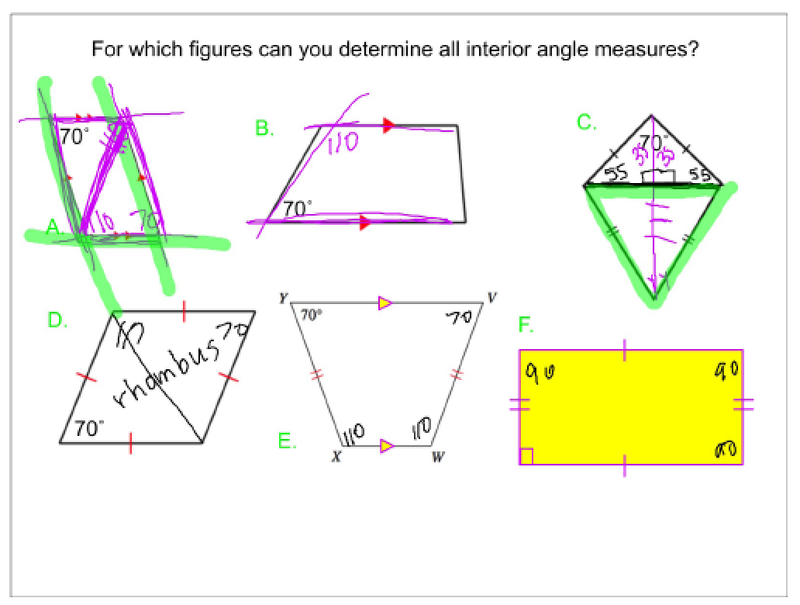 Can you tell whether you have a right triangle? Then they realized that they all had right triangles. But they still didn’t know how to sort themselves into a team. And at some point, I realized that I would either have to intervene, or we would spend our entire first day of the new unit on Dilations sorting into new teams. Does anyone know what our new unit is? Can someone give me a card? We wrote several of them on the board. And then they found their Pythagorean families with the primitive patriarchs. 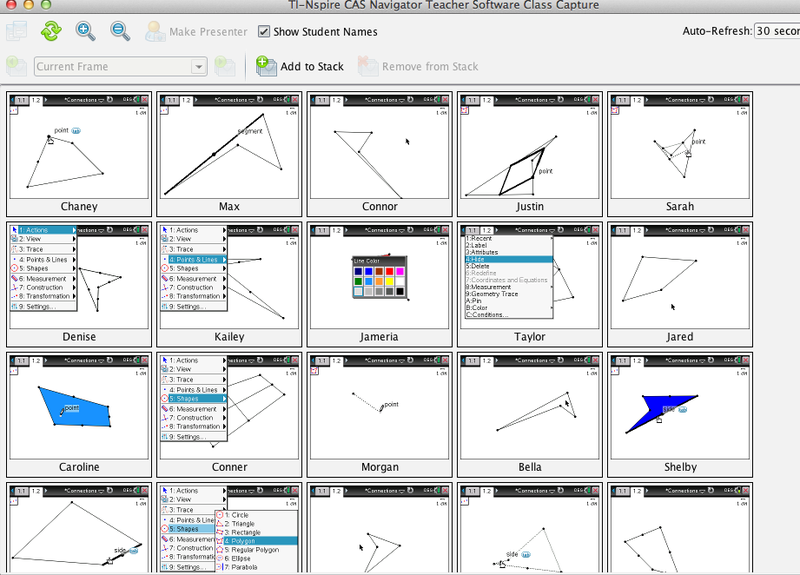 Another class sorted themselves by columns instead of rows (see card image below). 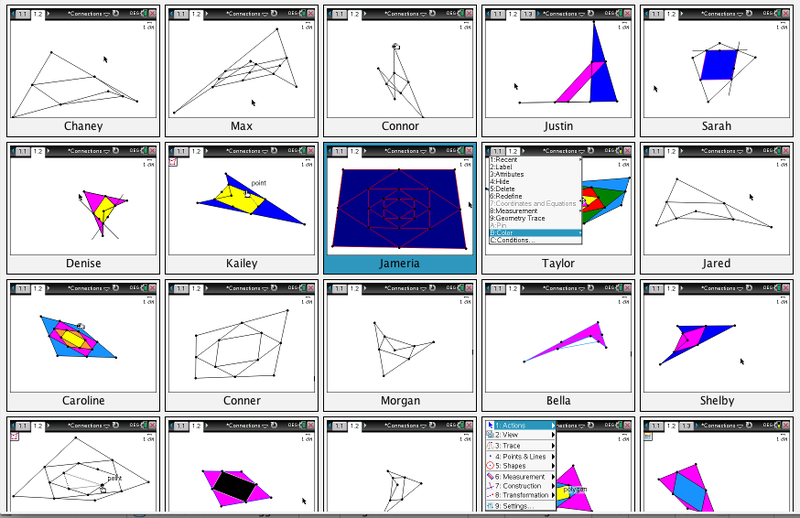 And another class sorted by rows correctly, thinking about scale factor, but had no idea that they were side lengths of right triangles. Card sets are available at this link if you’re interested. Share them back with us if you improve them! And let us know if you have any ideas for our remaining units, as we have a lot to live up to after the Dilations team sort.